Thanks for coming back to my tutor assessment week! If you missed my kick off post, you'll want to read it here. Today, let's jump in and look at both free and paid options for assessing your students in math. This is a wonderful site with a complete math program. 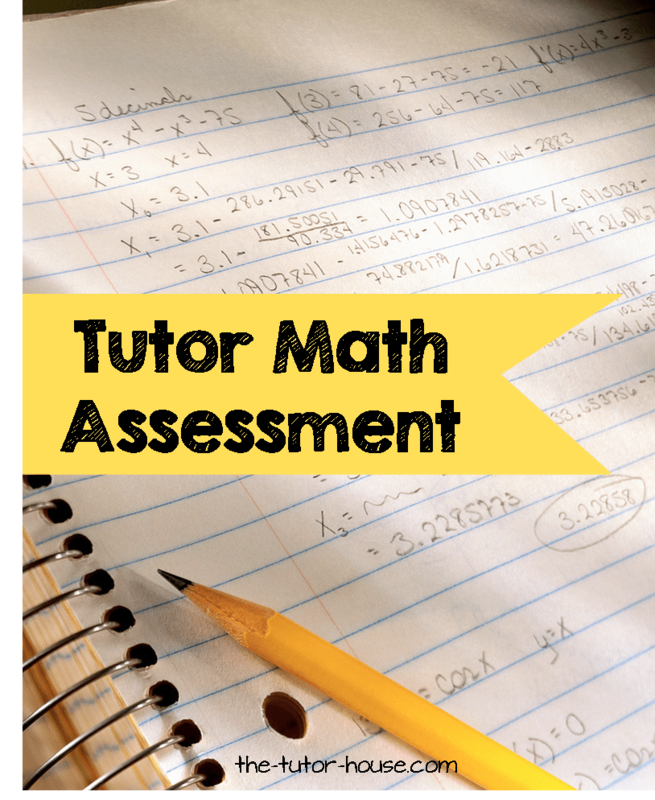 They provide assessments in math for grades 1-6. The tests are meant to be given for the grades the student has completed. For example, if you have a student that just started 5th grade, you'll want to give them the 4th grade assessment. If the student scores 80% on the assessment, they have a fairly good grasp of the concepts taught in 4th grade. I like their assessment because they break it up into topics which are clearly marked on the test. BUT my most favorite feature of Math Mammoth is that they give you answer keys and tell you how to score them. I really appreciate their attention to detail! Read more about Math Mammoth here. Much like Math Mammoth, they provide comprehensive free assessments but for older grades. They have answer keys as well which makes your life much happier! I also like that the assessments are shorter. 10 questions! Learn more about Thinkwell Homeschool here. This is a great site because it gives such in depth information when you go through an assessment. It's all aligned with common core standards. When there is a gap in the child's knowledge, you can clearly see what topic with in the common core. I was blown away with the site! They do have a free trial so that you can get familiar with the program and see for yourself it's value. Let's Go Learn makes assessment affordable with great results! It's just $20 per test. Don't you think most parents would have no problem paying that? If you charged them $60, you could do three assessments during the school year with the student to show progression and to help you alter your lessons too. At the end of the assessment, you can print out the results and go over them with the parents. Don't forget to let them know what plans you have to help their child! Learn more about this site here. This is similar to Let's Go Learn with both free and paid versions. You'll find fun games, worksheets, and of course assessments. They also provide placement tests, but you have to pay for a year's subscription to get access to their assessments. It's only $79 per year and that includes unlimited students. If you charged a $20 assessment fee to just 4 of your students, you would have this expense covered and provide assessment data to parents. Read more about Moby Max here. Whether paid or free, there are great math assessment resources out there. Sign yourself up for a trial on the paid sites and decide which one works best for you! Each time I find a new assessment, I try to share it on my Tutor Math Assessment Pinterest Board. Make sure to follow along! What assessments have you used and found success with? http://www.mathusee.com also has math assessments for each level. Theirs is a bit more specifically skill based until you hit pre-Alg and also come with answers. In the primary levels, there are assessments for addition, subtraction, multiplication, division, fractions, and decimals.